This weekend is the War Eagle Tailtwister 25K in Rogers, AR. Cannot freaking wait! I've never ran a race in Arkansas and from everything I've heard and read, this race will be amazing. Hilly, scenic and lots of fun things to do in the area. I briefly thought about running the 50K but the always nagging ITB and hip have been especially cranky lately so it'll be the 25K for me. Dave is going to run the 3.8 miler. We have a weekend of running, bluegrass and exploring to do and I'll do a race recap when we get back. 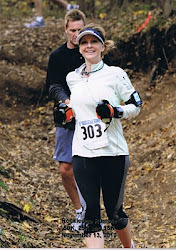 Last weekend I had the great pleasure of getting to run 7 miles out at Thunderbird Trails with my cousin Jenny. The miles flew by with great conversation and nice breezes to cool us off. I have been running much lower mileage since the 50K in April. I'm hoping to stick with the lower mileage through the summer to rest up for some ultras this fall. 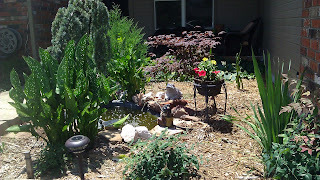 We've been busy with landscaping projects and I'm in total obsession mode right now creating new planting beds in the front yard and will spruce up the backyard some more after that. Should have some veggies from the garden soon! I love this time of year before it gets miserable hot, when it's still enjoyable to be outside exercising and growing things. One more random thing I am so excited about.. I ordered some Saucony Kinvara II's from Running Warehouse and am in love with these shoes! I have been wearing mostly minimalist shoes the past year. I wear my Merrell Pace Gloves every day to work and my feet feel so much better and stronger. I also wear them at boot camp, hiking and working out. Don't know that I'm quite ready to wear them running yet as they are as minimal as they come, almost barefoot. I wear my New Balance 101's on the trails for shorter runs (ten miles or less) but for longer trail runs and most road runsI was still wearing my old New Balance 769 stability shoes. They were worn out and I was really looking to find something that was more minimal with a 4mm or less heel drop. Saucony Kinvara's fit the bill and had such great reviews. I ordered them without ever even trying any on and anxiously awaited them to be delivered. It was love at first sight and run! The second I put them on I knew these shoes were made for me. :) They feel SO incredibly light and perfect in every way. I was needing a transition shoe...something light and minimal until I'm able to wear the Merrell's or 101's full time for all runs. Running Warehouse is AWESOME. I've placed numerous orders with them the past few months and have never been disappointed. They offer free 2 day shipping and have great prices. There are several give-aways out there for some Saucony's if you have thought about trying them out, or if you already love Saucony's and just want to try for a free pair! Here is a link to Amanda's give-away, and here is a link to Shut Up and Run's give-away.